Directly on leaving the meeting place, they came to Simon and Andrew’s house, accompanied by James and John. Simon’s mother-in-law was sick in bed, burning up with fever. They told Jesus. He went to her, took her hand, and raised her up. No sooner had the fever left than she was up fixing dinner for them. That evening, after the sun was down, they brought sick and evil-afflicted people to him, the whole city lined up at his door! 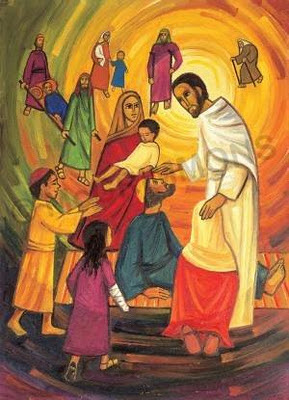 He cured their sick bodies and tormented spirits. Because the demons knew his true identity, he didn’t let them say a word. When it was still night, way before dawn, he got up and went out to a secluded spot and prayed. Simon and those with him went looking for him. They found him and said, “Everybody’s looking for you.” Jesus said, “Let’s go to the rest of the villages so I can preach there also. This is why I’ve come.” He went to their meeting places all through Galilee, preaching and throwing out the demons. How do I start my day? What was their expectation of Jesus? Does Jesus see preaching and healing as the same thing? Is this a message about parochialism?